I have yet to attend a Federation meeting as president so it feels a little strange writing this introduction. Thanks for nominating and electing me as president. Before that I never envisaged myself being in the position and was happy continuing my last 35 years or so involvement with societies I am member of and exhibitions I have been part of. Being President is a challenge I am looking forward to – even now I’m surprised at the amount of work involved with the efficient running of Federation. 2016 promises to be another busy year for our exhibitors with exhibitions happening around the world – including China, Taiwan, USA, Thailand and three in Australia – as well as Christchurch in November. This promises to be another very successful event. I enjoyed their previous one in 2012 and look forward to going back down there later this year. One of the main tasks we have this year is sorting out a long-term solution for Federation’s exhibitions frames. The frames were gifted to Federation in 1990 and distributed around New Zealand to member societies. Used in various ways over the following years more and more maintenance is required and storage for most has become a problem. At the 2015 AGM Federation was requested to investigate and establish a solution during 2016. We will be consulting with societies to get their input to this process to ensure we get the best outcome. Questions such as ‘Where and under what conditions and costs are they currently stored?’, ‘What use is made of them?’ etc. will be posed and it is essential Federation receives your views. I hear individuals say they believe Federation is just an organisation dealing with exhibitions and my comments above may seem to reflect that view. Exhibitions are a critical element of what we are and to keep our reputation in world philately we must remain linked with international bodies such as FIP and FIAP and continually maintain the rules for, and standards of, our exhibitors and judges. However, I feel we should be more connected to individual members of our societies and clubs. We need to get more information and news out to our societies and information and news back from them. This newsletter is one way of doing that but the more people see it the better, ie not just the societies and clubs but their members. The newsletter is published on the Federation website shortly after it is sent in hard-copy format. I have asked our editor to forward an electronic copy of the newsletter to our societies and clubs and they may wish to forward it in turn to those of their individual members for whom they have email contacts. I have also asked our webmaster to set up a form on the site so individuals can request notification when the newsletter is published on the website. A note from the editor. Much of the information contained in this newsletter was intended for publication shortly after the Federation executive committee meeting of July 2015. 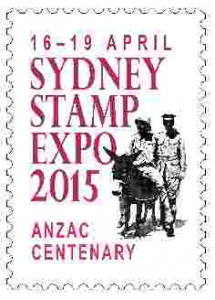 My involvement in The Capital Stamp Show 2015 organising committee and other factors meant this did not occur. However, I believe most of the material still has relevance because it recognises the efforts and achievements of individuals and our member societies or clubs. I do apologise for the late acknowledgement of these efforts. At the July 2015 executive committee meeting nominations for NZPF awards were considered and agreed. Following the meeting an executive committee member presented the award to the recipient at the first opportunity at a meeting of the recipient’s society. We regret the delay in notifying the outcome. Brian was nominated by the Auckland Philatelic Society. Brian has been on the club’s committee since 2000 becoming secretary in 2011. He ran the annual Auckland Society exhibition since 2012 and in 2015 this task was enlarged to incorporate NIPEX. He has exhibited at local, interclub and national levels and is a regular speaker around North Island clubs talking on topics such as The Chaco War, NZ 1923 map stamp and Pim’s stamp dealership. On a wider front Brian is the Asia-Pacific representative of the Cartophilatelic Society. Brian being presented with his award by Barbara Street, Northern delegate to Federation. 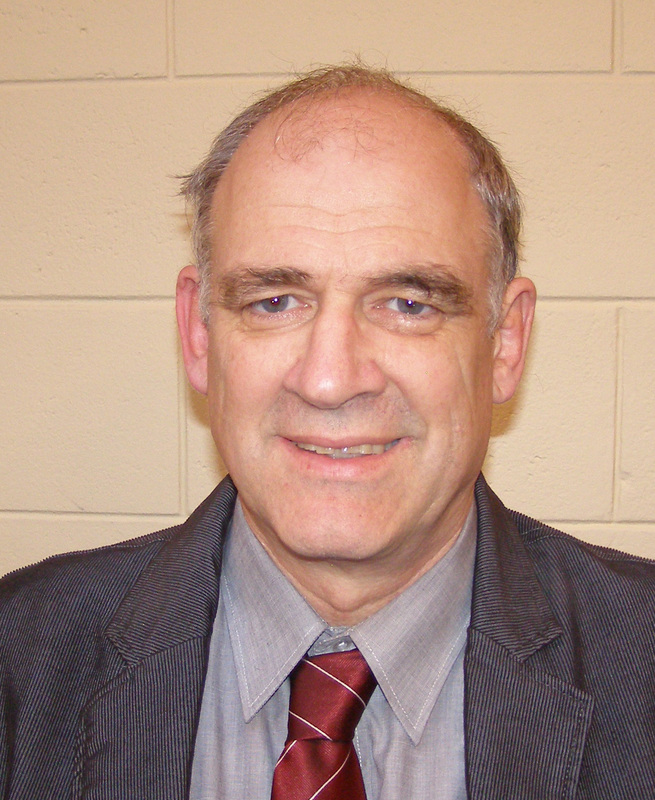 As a philatelic writer Brian entered his 15th year as editor of the society newsletter in 2015, has supported other local society newsletters with articles and comments and has written several articles for the NZ Stamp Collector, The New Cartophilatelist (journal of the Cartophilatelic Society), NZ Map Society Journal (on the 1923 map stamp) and in 2011 wrote If you take care of the pennies, the fullfaces will look after themselves (a history of Pim & Co).Brian was nominated by the Auckland Philatelic Society. Brian has been on the club’s committee since 2000 becoming secretary in 2011. He ran the annual Auckland Society exhibition since 2012 and in 2015 this task was enlarged to incorporate NIPEX. He has exhibited at local, interclub and national levels and is a regular speaker around North Island clubs talking on topics such as The Chaco War, NZ 1923 map stamp and Pim’s stamp dealership. On a wider front Brian is the Asia-Pacific representative of the Cartophilatelic Society. 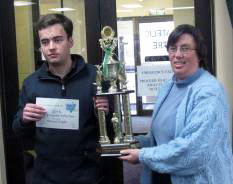 Mike being presented with his award by Barbara Streeter. 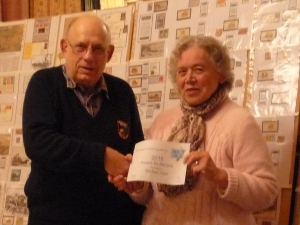 Mike was nominated by the Association of Northern Philatelic Societies. Mike has been involved with youth clubs since the 1980s when he ran his own club in Central Auckland and continues now as a leader in the City of Sails Youth Stamp Club and executive member of PYC. A member of the Wellesley Philatelic Society since 1979 he joined their committee in 1981 and over the ensuing years has served as President for four different terms and held a number of other positions. His exhibiting interests lie in the Open Class which he has entered at club and regional interclub level while Mike has given talks on many of his interesting collections to clubs in the northern region. Mike is president of the Association of Northern Philatelic Societies an organisation for which he has made many significant contributions over the years. 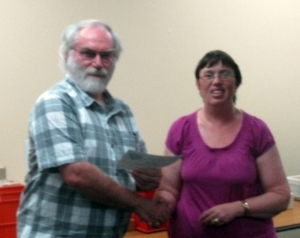 Graham has been a committee member of the nominating society, The Christchurch Philatelic Society, since 1988 and was treasurer 1992-2015 and president 1997-99. He was founding member of Canpex Inc and was on the committee 1997-2010 and has actively involved with the committees of the Philatelic Foundation and Philatelic Properties Ltd and is a member of a number of other philatelic societies. Graham was involved with the last three national exhibitions held in Christchurch and was treasurer for Kiwipex 2006. He has been a national exhibitor and is a philatelic literature judge. Graham receiving his award from Karen Jeffrey Southern Region delegate. Warrick being presented with his award by Karen Jeffrey. Warrick has been a member of the Christchurch Youth Stamp Club since he started collecting approximately six years ago. From his first meeting Warrick has been committed to youth philately. He participates at each monthly meeting, bringing items of interest and giving short talks on revenues etc. He helps set up and clear up and is a valued member. He helps the younger children with their projects.Over the last six years Warrick has been awarded the best project and best overall club member trophies on numerous occasions. He has completed all of his PYC Achievement Awards receiving a gold award earlier this year. lAn active member of the 2015 Stamp Camp committee Warrick helped organise the program, designed the artwork for the CAL camp cover and participated in all planning activities for outings etc. He helped organise the sausage sizzle fund raiser over Waitangi weekend. Warrick commenced exhibiting with an 8-page exhibit and has gone on to create exhibits that have won youth grand awards, special prizes, etc at both national and international levels. He researched extensively the NZ airport tax stamps and for this effort he has received formal felicitations from exhibition juries for his exhibit on this subject. The first day of the 2015 stamp camp began at 7.30am with the arrival of our first camper from Wellington and a large group arriving around lunch time. After airport pick-ups and loading of a minivan and trailer we headed off to Hanmer Springs. By Saturday morning the computers and printers had been set up, internet access organised and we were all set to get down to business. Fred Saunders came for a visit after lunch and brought a variety of material for campers to look through and later gave a talk on his various exhibits. On Sunday in between talks and working on projects there was a visit to the hot pools or a bike ride around Hanmer Springs. Jeff Long arrived on Monday morning bringing with him a large collection of modern postcards to be used for our postcard challenge. Jeff gave a short talk on postcard exhibiting then teams were each given a pile of cards and one hour to produce a 4-8 page postcard exhibit. Every team managed to complete the challenge and the exhibits were judged by Jeff the following day. Steven McLachlan and Greg Crawford came up on Tuesday morning bringing stock for everyone to look through and after lunch Steven gave a talk about the different ways of acquiring new material for your collection. A box of commercially used envelopes featuring ANZAC stamps, donated by NZ Post, proved to be very popular. Everyone had a good look through the envelopes and most people managed to get one of each Anzac stamp on cover. Work on projects had intensified since Monday with everyone wanting to complete their project by the 10.30am deadline on Wednesday. All projects were handed in on time and every camper managed to complete a project. After Wednesday lunch off site activities were arranged while the camper’s projects were judged. This year there were five national judges on our judging team. After dinner we had our prize giving. Everyone received a certificate of participation, camp cover and goodies bags were distributed. The Rob Hunt Cup for best project was awarded to Rose McTaggart, the Val and John Hunt Trophy went to Ciara Gibson and the Iris Tyson Award went to Lukas Anderson. After the formal awards were made the senior campers then presented their camp awards. Everyone is fair game for these awards with some including biggest paper waster, worst backing and other odd things that happened during camp. By morning tea time on Thursday morning we were ready to hit the road home. This was a great camp that produced excellent results. Big thanks go to everyone who attended for making it so enjoyable, and to all our leaders, helpers and dealers who supported the camp. The 2016 youth stamp camp is to be held Sunday 17 April until Saturday 23 April 2016 at the NZ Cadet Force Training Centre, Haitaitai, Wellington. The NZ Postcard Society hosted weekend sessions in Christchurch on May 9/10 and Paraparaumu on May 16/17. These were attended by a wide range of people who were already exhibiting or planned to. The event enabled those present understand more about the technical aspects of postcards, particularly their production, and how this information along with other elements of any postcard can be displayed in an exhibit. The participants were all involved in judging sample exhibits to enable them all to better appreciate what must be considered when exhibiting. The Association of New Zealand Philatelic Judges held one day seminars in Auckland and Wellington on 4 July and 26 July respectively. The association aims to hold seminar/workshops each year in different venues to provide a good opportunity for their members to attend. Often, these events welcome non-judge exhibitors which provides such people with insights into how the judges go through their evaluations of exhibits, what is happening with exhibiting elsewhere in the world and learning what exhibiting rules may have changed and how these might be applied. You should keep an eye out for future notifications of such events. Your editor wondered whether to include this article in the ‘learning opportunities’ or ‘club news’ and opted for this location. It demonstrates how relatively simple it can be to arrange workshops for your members. If you do plan such sessions why not invite your neighbouring societies along as well. This could really add to the fun, enjoyment and learning experience. Linking such event with a visiting speaker (if they are willing to assist) or contacting the Association of NZ Philatelic Judges (see contact details on the NZPF website) or emailing the Federation secretary may find someone with the needed skill to help run such events. It clearly must have worked because Tauranga won the Ambury Shield for the first time in all the years they have entered. Congratulations to everyone involved! The Federation secretary received a query from a teacher. 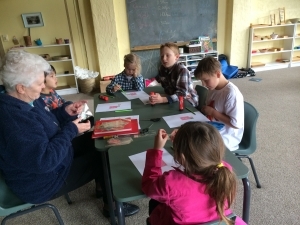 The message said “… one of our children has given us their grandmother’s stamp collection. … would you be able come and tell us some history about the stamps?” This message was passed in turn to Trevor and Anne Bevan who live near the school with a request to assist if they were able. And they did! The following is Anne’s report. 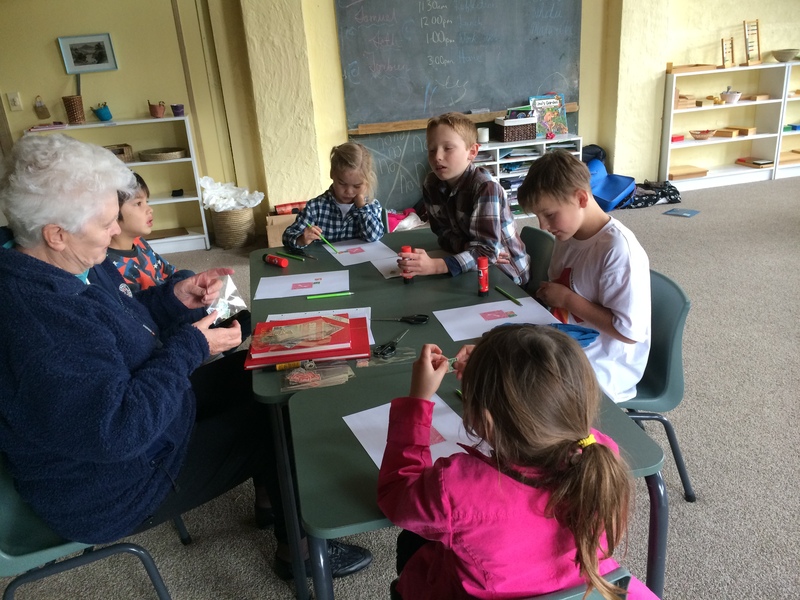 Recently Trevor and I visited the Montessori School in Silverdale, Auckland in response to their enquiry to Federation on what the children could learn about the NZ stamps they had been given. After Trevor’s initial visit to look at their collection and what they envisaged the children could learn from them, I went prepared for a short introduction on how stamps came about, which ended up in a two hour session!! So, from seeing a Penny Black and an article on Rowland Hill, and what NZ’s first stamp was based on we talked about the first province in New Zealand to celebrate one hundred years of settlement in Otago. Using the designs of the stamps to tell the story of our early settlers, and the illustrated booklet on James Berry’s designs for Otago Centennial in 1948 a very relaxed and informative afternoon was had by all. A further visit is already planned when I plan to explain about our health camps and how our health stamps raise money for some of their costs. The Regional Stamp Show is based around the NZ Stamp Dealers Association’s (NZSDA) Wellington stamp show. A partnership of the four Wellington societies – Kapiti, Hutt Valley, Upper Hutt and Wellington – with support from Royal work closely with the NZSDA to run this annual event. The Societies compete for the Neville Harris Memorial Trophy in a one-frame competition. The standard over the last years has been very high and the competition, while not fierce (it seems inappropriate to use that word in relation to philatelic competition), has been very close and 2015 was no exception. 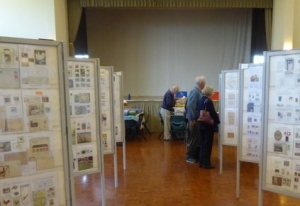 The show, which was held 2-3 May 2015, saw the Kapiti Philatelic Society just beating Wellington Philatelic Society. The Auckland Philatelic Society held its Annual Exhibition at the Mount Eden War Memorial Hall on 6 – 7 June. The Exhibition was open to the public from 10am to 4pm on the Saturday, and 10am to 3pm on the Sunday. The exhibition incorporated NIPEX 2015, an 8- or 16-page competition open to all North Island societies and clubs.There were 39 entries, from 20 exhibitors belonging to nine clubs. The nine clubs were APS (6 entries), City of Sails (1), Horowhenua (1), Howick (3), North Shore (15), Pukekohe (2), South Auckland (3), Thames Valley (2), and Whangarei (7). Thirteen of the fifteen entries from North Shore were from the same person. The venue took the ten dealers and 38 frames very comfortably. There were no problems gaining access to the hall. The weather was moderately fine (but with showers) both days of the exhibition, but the hall itself was very cold, particularly in the afternoons. Mark Benvie and Denise Rosenfeldt acted as judges, and put hours of work into their task. The Senior Citizens’ Hall at Mt Albert was hired for the Friday evening a week before the exhibition for the judging to take place, and after four hours they still had exhibits to judge, which they took home with them. Further judging took place at the exhibition itself. Unfortunately not all of the judges’ critiques were available at the closing of the exhibition, and those that were not ready were later lost in the mail, when the judge posted them to the exhibition organiser. There were eight classes and a stock book, provided at cost by Philatelic Distributors Ltd of New Plymouth was given as a prize for the winner of each class. A grand prize donated by Auckland City Stamps was won by Frank Jans from Thames. Having a competitive exhibition greatly increased the workload of the organiser. The initial assistance of Monica Comrie was greatly appreciated. A number of exhibitors have expressed the wish that the competition be repeated next year. NIPEX 2015 was part of APS’s annual exhibition. There were ten dealers present, five of whom were from “out of town”. An innovation this year was having a postcard dealer present. As per usual, some effort was put into advertising the exhibition. A flyer was prepared and distributed to various dealers, local public libraries and community notice boards. Advertisements appeared in the New Zealand Herald on the Saturday before the exhibition, and on the Saturday of the exhibition. Various community newspapers were emailed with a request that the exhibition be listed in their community noticeboard columns. This is a very useful form of advertising, and costs nothing. The exhibition was advertised in the APS Newsletter. Flyers were sent to all North Island clubs inviting them to participate, and asking that the exhibition be mentioned in their newsletters. The complete absence of exhibits from major centres such as Wellington, Palmerston North, Hamilton and Napier/Hastings was disappointing. The Wellington newsletter gave our exhibition a good write up, suggesting that it was an ideal place for exhibitors to practice their craft before entering the Wellington national exhibition later in the year. NIPEX 2016 is scheduled for 11-12 June. Pat Smit reports on the annual club meet, held in 2015 at Kerikeri on 13 June as follows. It was a beautiful day for a trip to Kerikeri and a lovely venue for the combined meeting at Kerikeri Golf Course Clubrooms where we were very well llooked after for the day – comfortable space with excellent catering. Two speakers, two dealers, two other stalls and an auction table plus lots of discussions around the room kept everybody happy all day. The first of our interesting speaekrs was Enid Honiss, from the Kerikeri Club, who spoke on her collection of perifns. In 1840 penny postage was intoduced and it was quickly found stamps were stolen by employees for personal use or, more importantly, sold back to the post office for the face value. To prevent this happening firms punched initials through the stamps for easy identification and as a deterrant. Enid explained she has been collecting perfins since she 8 when she discovered they were cheap and readily available in bulk. Only recently has she been encouraged to organsie her collection into an interesting display. We saw examples from as early as the 1850s through to when the practice is generally accepted as stopping approximately 100 years later. The second talk followed lunch and more browsing through stock and this was by Ron Webb on the subject of Brazil. Ron took his audience through the history of Brazil with its founding by Portugal and its later uprisings and revolutions. The postal history of Brasil cannot be separated from its many monetary reforms and severall hyper-inflationary periods. He completed his display with his favourites – the country’s definitives and, of course, stamps on the ‘Beautiful Game. Thanks to all who made this an enjoyable day. The 2016 Combined Meeting is being held in Whangarei on 18 June at the St Johns Chruch Hall, Kamo between 10am and 3pm. The 2015 National Interclub Competition was hosted by the New Zealand Stamp Collectors Club and held on Saturday 8 August at The Philatelic Centre in Christchurch. Seven clubs entered the competition which led to there being 35 frames of very interesting material on display. A numbers of stamp dealers were present during the day for collectors to try and obtain those missing items from their collections. It was also the first day of issue of a new CAL showing a close up image of the planet Pluto including the newly named Hillary Montes and Norgay Montes. Judging of the exhibits was done by Jeff Long, Sue Claridge and Karen Jeffrey and began early Saturday morning. By early afternoon the judging was completed, results were totalled and then the results were announced. Congratulations to the Waikato Philatelic Society who were the overall winner with 421 points. 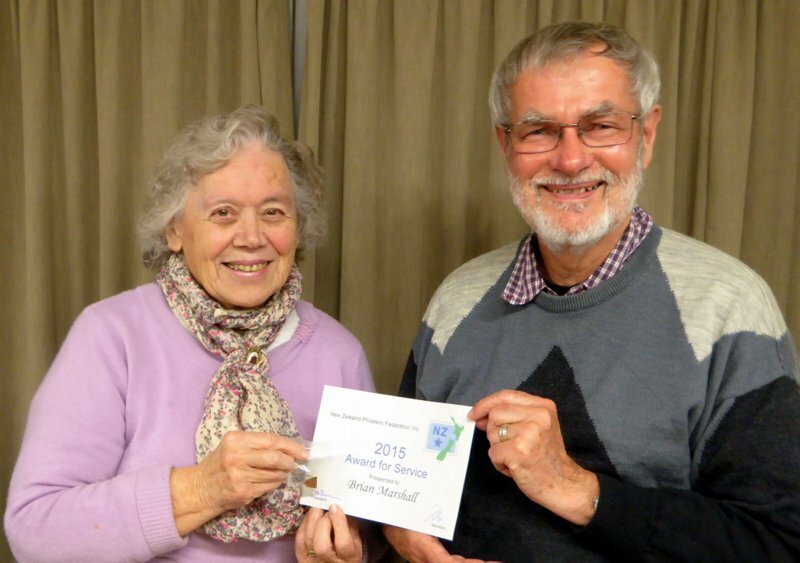 Other results were Whangarei Philatelic society 375, Christchurch Philatelic Society 373, New Zealand Stamp Collectors Club 372, Marlborough Stamp Collectors Club 368, Manawatu Philatelic Society 336 and Kapiti/Horowhenua Philatelic Societies 327. On behalf of the Waikato Philatelic Society Bruce Tapp received the interclub trophy from Stamp Collectors Club President Steven McLachlan. 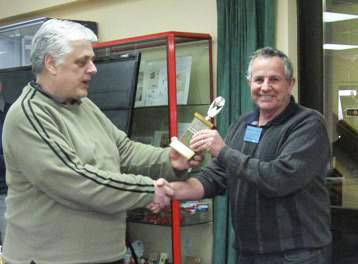 Steven McLachlan presenting inter-club trophy to Bruce Tapp of Waikato Philatelic Society. The Waikato Philatelic Society has since advised the 2016 competition will be held in association with their normal Ambury Shield event. This will take place on Saturday 29 October 2016 so entrants can also take part in the Christchurch 2016 National Exhibition in November. After the 2015 event Steven sent the following note and image. An interesting aspect of the exhibition is that we had a report done about the Exhibition in the South Island Chinese Newspaper and so I’m attaching an image of this report.As you can see I’m pictured at bottom right while our committee member Doug Prescott is in the picture above. You are welcome to reproduce this illustration as it shows off our hobby in a good light. 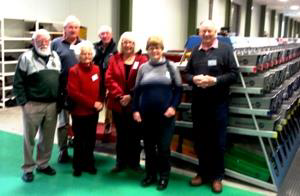 Several members of the Horowhenua Philatelic Society visited the new Manawatu Mail Sorting Centre in Palmerston North. The centre processes mail for the lower half of the North Island and operates almost 24 hours a day. Individual booths act as sorting centres for each of the areas with pigeonholes for each of the postie’s “walks”. Mail is hand sorted in these areas. Members were fascinated to watch the automatic sorting machine in action, with mail again sorted into “walks”. On the day we visited Sky magazine was being processed with huge bins full of the magazine to be distributed. While members visited, a postal lorry arrived at the centre driving into a covered loading bay. Mail was very quickly and efficiently unloaded. The staff was very friendly and helpful, and were happy to answer any questions, the section dealing with incomplete addresses or damaged wrapping providing one of many highlights for members. This event, formerly known as the Manawatu Philatelic Convention, is this year having its scope widened in an attempt to broaden interest and increase attendence. It will include the regular business meeting for the Central Region societies but will have guest displays, dealer stands (at least seven are known to be coming), club and society tables, guest speaker, spot prizes, a display from the Manawatu philatelic Society library and offers a an on-site cafeteria.It is to be held 27 February between 9:30am and 4:00pm at the Community Leisure Centre, 569 Ferguson Street, Palmerston North. New Zealand Post has agreed to change their policy regarding stamps (particularly unused) being considered prohibited items when sent in the mail. From now on stamps will be considered restricted items.At the July 2015 Federation meeting Simon Allison indicated that the process of changing all of the documentation relating to this issue could take a while – for example, the Post office Guide is generally only changed annually. Because of this some post offices may take a while to adopt the new policy so please bear with them. Simon also advised he would be looking at a possible interim solution should issues arise. This resulted in a letter of exemption being provided. A copy can be found at NZ Post letter of exemption. In order to ensure we’re providing a better quality of service to our philatelic customers, we have taken it upon ourselves to review our date stamping policy and to put a simpler and more effective policy in its place. From 21 September 2015, any customers who wish to have their philatelic mail hand cancelled can now send their mail to one of the three Mail Service Centres or the Whanganui Collectables and Solutions Centre.To coincide with this change, a new pictorial date stamp has been developed for the Manawatu Mail Service Centre and the date stamps for the Auckland and Christchurch Mail Service Centres have been updated. You will also be able to have mail cancelled with the Ross Dependency date stamp via the Christchurch Mail Service Centre, but this will only apply to Ross Dependency stamps. To have your mail postmarked on the first day of issue of these date stamps, please send any addressed mail you would like cancelled inside a postage-paid envelope to our Whanganui Collectables and Solutions Centre, noting which date stamps you would like used on your mail, by 14 September 2015. For all other mail going forward, please send the addressed mail you would like cancelled inside a stamped envelope to our Whanganui Collectables and Solutions Centre or one of the Mail Service Centres. See the address details and postmarks below. If you have an existing relationship with staff at your local PostShop, we will leave it up to the discretion of the PostShop manager as to whether or not they will continue to process requests for hand cancelling philatelic mail, but there is no requirement for them to do so. Though we believe this will be the best solution moving forward, and should ensure consistent, high quality hand cancelling, our Customer Services Team in at our Whanganui Collectables and Solutions Centre are more than happy to answer any questions or concerns you may have. We have several philatelic date stamping facilities across the country. If you wish to have any philatelic mail cancelled, please send your mail to one of the following locations to be cancelled inside a postage-paid envelope. Please note that the Ross Dependency date stamp can only be used on mail with Ross Dependency stamps. Lindsay Chitty, the New Zealand Commissioner to Sydney 2015, provided a very detailed report to the July meeting of Federation. 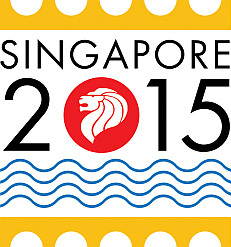 The following provides some excerpts from this report.Obtaining entries was quite difficult because of the level of activity of National, FIAP and FIP exhibitions in Asia and South East Asia this year but NZ managed to exceed the organisers’ expectations with 79 frames and 4 literature entries accepted. The New Zealand exhibitors of Youth and Postcards who entered for Sydney are to be congratulated as New Zealand was well represented in these classes. • Barry Scott’s Aerophilately exhibit “The Royal Air Force Desert Air Service” which he personally delivered. • Hadley Muller’s one frame Postcard youth exhibit “Native Birds of New Zealand” which I took with me as Commissioner. The exhibits were transported in a chest designed for the purpose, one other large metal suitcase, and two exhibits were carried as hand luggage. They weighed 57Kg; the packed chest weighing 30Kg. On the return, Air NZ stated each item of luggage had to be less than 23Kg, and they said “don’t do that again”. On the return, the plane was loaded at Sydney in a torrential storm. The metal case had a fabric zipper, and about 10 exhibit envelopes were delivered at Auckland wet around the edges. They were immediately unpacked and fortunately the page protectors had prevented any damage to the pages. The exhibition was held at the Johnny Warren Indoor Sports Centre at the Hurstville Aquatic Leisure Centre, Hurstville. This is some way from the centre of Sydney, but was a very good venue. There was plenty of room between the rows of frames to view the exhibits, and the Stamp Dealers had a spacious area for their use. Lindsay did a detailed analysis of the awards achieved by class and demonstrated New Zealand results were generally consistent with the total results but having significantly more Large Vermeil awards. Jenny Banfield, NZPF Commissioner to Taipei reported she took 21 frames of exhibits which at 10.6 kg enabled Norman and herself to hand-carry them and avoiding any excess baggage problems.She advised that the NZPF Customs Agents needs to be provided with an approximate total weight of the exhibits being carried. New Zealand exhibitors present were Lindsay Chitty (with his wife Gillian) and Ross Marshall. Jenny said “it was a well organised and friendly exhibition”. The commissioner, Stephen Chivers, reported that over 3,300 frames were applied for but as there were only 2,500 frames available a lot could not be accepted.He advised that around half of the New Zealand exhibits dropped in marks but in an FIP exhibition you are up against the best and the judge’s knowledge and skill should be higher.On checking the exhibits into the Exhibition bin room, most exhibits like mine (1 or 2 covers to a page) were done very quickly, but a thematic exhibit took over an hour to check, counting all the stamps, checking if covers were windowed, etc. and then double checking all the items on a page. Postal History, Youth, Aerophilately, Postal Stationary and Tradition seminars were held during the exhibition with good attendances. Most were attended by at least one New Zealander at the show (David Loe, Lindsay Chitty, Tony Thackery, Pat and Colin Capill, Jenny and Norman Banfield). The communication from the Singapore commissioner general was very good and they provided clear instructions for working with Singapore Customs.It was a well organised and friendly exhibition and it was very convenient to have the official hotel across the road from the exhibition hall. Our commissioner Norman Banfield advised that this FIAP exhibition held at the Hong Kong Convention & Exhibition Centre – the same venue as previous exhibitions.There were 223 competitive exhibits in 952 frames from 20 FIAP countries and with invited exhibits there was close to 1,000 frames. There were 40 booths for dealers, postal administrations etc. 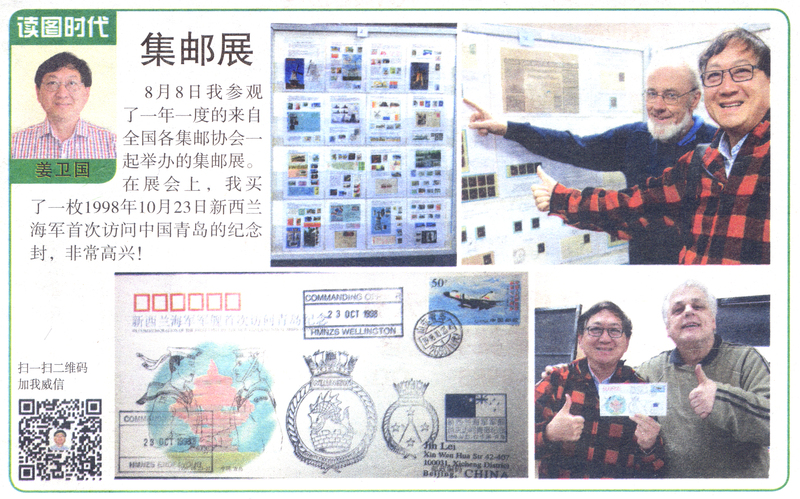 In addition, Hong Kong Post had a large stand with 7 counter positions and long queues each day for the special stamps and miniature sheets. On opening day at least one person started to queue at 5 am there were the usual special daily cancel facilities. Jeff Long of Christchurch was on the Jury and judged the Youth exhibits.Both Jenny and Norman Banfield presented PowerPoint seminars: Jenny on Open Philately and Norman on Improving Your Exhibit – applicable to most classes but based on postal history. Both were well received but it was a bit daunting being on the stage of the main exhibition hall rather than in a separate room. The official hotel – The Empire Hotel – provided good facilities and was about a 7 minute walk from the exhibition. Overall, Norman advises it was a good show – very friendly and it was nice to renew friendships. Stephen has spent most of his life in New Plymouth, migrating to the Hutt 17 years ago. Initially joining the Post Office in 1973 on the telecommunications side he moved to Telecom (when the Post Office was split in 1987) and later Downer (when Telecom split off that part of their operations in 2000) and currently is involved in designing fibre installations as part of the ultra-fast broadband rollout.He commenced collecting stamps on a casual basis at an early age but on joining the Post Office and having a little extra money he was pointed in the direction of stamp auctions and became more serious. He specialises in the stamps and postal history of South East Asia and has fun collections of Taranaki and Wanganui postal history as well as an eccentric aim of trying to fill up old printed albums of the world with stamps. He got the bug of exhibiting in 1985 when involved in Tarapex 86 and has exhibited regularly since then. His exhibit on Burma postal history has competed well at international level where he has worked his way up from an early silver medal in the 1980s to FIP gold in 2015. Lately he has concentrated on a traditional exhibit of the NZ 1985 bird set but appears to have run out of available material. As a result he is currently working on a modern postal history exhibit for Christchurch 2016 and a couple of 1-frame exhibits. He qualified as a national judge in 1988 and has judged at exhibitions throughout Australasia ever since. In 2015 he completed a successful apprenticeship as an FIAP (Federation of Inter-Asia Philately) judge. As far as exhibitions are concerned Stephen first got involved as exhibits and bin room officer at Tarapex 86. This exhibition, with over 1700 frames and lasting for 10 days, was a good learning curve for the future. He was Federation coordinator for Palmpex 99, Tarapex 2008 and Baypex 2014; Chairman of Tarapex 98, Welpex 03 and The Capital Stampshow 2015; and, Secretary for Huttpex. 2007. In addition he has also acted as NZ commissioner for various overseas exhibitions in Australia, China, Singapore and India. Stephen has served on the committees of the Taranaki, Hutt Valley and Royal Philatelic Societies for varying periods over the last forty years having held many positions in each. He first represented the Taranaki Philatelic Society on Federation in the 1980s and later represented the Central Districts region prior to leaving New Plymouth, and over the last few years has been the Association of NZ Philatelic Judges’ liaison with Federation. At the November 2015 Annual General Meeting Stephen was elected President. If you would like to receive notification when the next newsletter is published please complete the registration form.